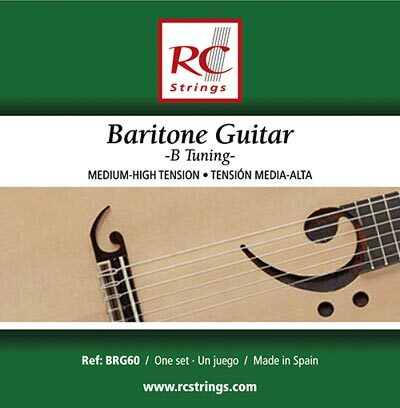 These strings are specially designed for a scale length of 660 mm (about 26 in.). Q: Would these be compatible with a Martin 000C Nylon with a 26.44 scale length? Q: Hey, I didn't understand - are those intended to use with a standard scale classical guitar or with bigger scale baritone guitar? Plus, what is the tuning? In the picture it says "B tuning" but on product page it shows regular tuning. "Raimundo Guitars at Guitar From Spain, one of the best guitar makers in Spain have recently introduced a new model of guitar in its catalog. Its not another classical, flamenco or acoustic guitar. Its a completely new instrument. The Classical Baritone Guitar. The guitar Raimundo Clave de FA is a new and unique instrument that has been created to complete the instrumental family of guitars. Considering the standard guitar as a Tenor instrument opposed to the requinto or Soprano Guitar, this new instrument comes to cover the low tessitura existing between the Bass Guitar and the standard or Tenor guitar, considering its tonal range, its right to call it Baritone guitar. The tuning on this new instrument is B-E-A-D-F#-B. For which it has a set of strings specially developed for this instrument. "The baritone guitar Raimundo Clave de FAis a guitar with a longer scale length, larger body, and heavier internal bracing, so it can be tuned to a lower pitch. This special guitar is a must to have for guitar collector and for the experimental musician."" Note- this instrument has a scale length of 660mm. We will be updating the listing to reflect this information. Q: Are these strings made for a 27" scale baritone guitar? That set should work fine on a 27" scale guitar. Q: What are the string gauges for this baritone set? Also, are the individual string tensions available for B tuning? A: Hello Randall, tensions are not available but we have added the gauges to our product page. Thanks!